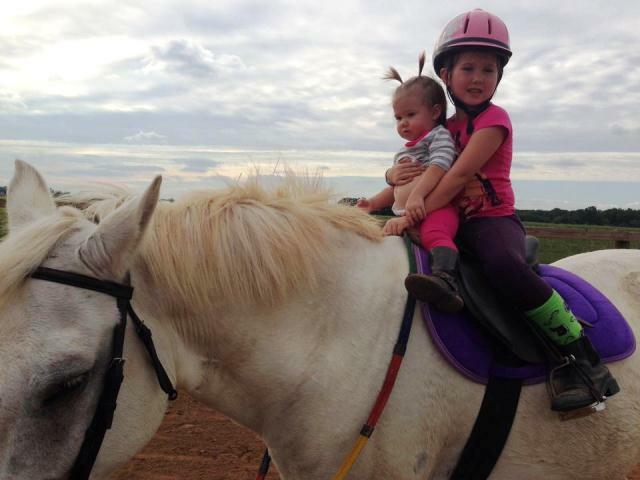 Six year-old Jordyn flew from the back of Feather at a gallop in the first part of August. (See post https://exechorseluver.com/?s=feather+bolts ). Thankfully, she survived the hard fall with some road rash, bumps and bruises, at least physically, but mentally the already timid rider retreated further into her walk-only safety zone. Having Jo fly off Feather, while I held the lunge rope and looked helplessly on, was one of the worst experiences I can remember. Honestly, I was no more willing to have that experience again than she! We brought Snowboy home and from her first night when they were reunited, her family has pushed her to trot. I have been noticeably quiet on the subject. It seemed that the more we pushed her to trot, the more reluctant she became. Snowboy is pretty reliable but he is not being ridden much, actually just the few rides Jordyn gives him and an occasional outing with me. I am not exceptionally sure that all would go well if they did trot. He wants to head back to the gate (and towards the barn-what pony doesn’t?). 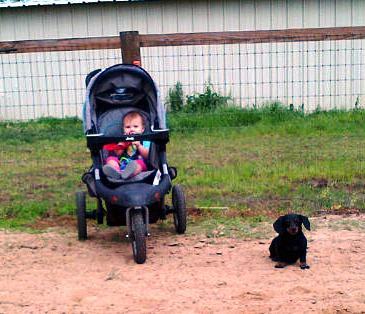 Jordyn has to work to keep him at the far end of the arena. And due to travel and illness on my part, Jordyn has not gotten down to ride as much as I would like either. Monday is the regular day to ride. We had a lot of rain over the weekend so I did not know if they would be able to ride or not. I had a late meeting so arrived at the house to find Ally and her girls already here. I do not believe that Snow had been ridden in over two weeks. I do believe he has already gained weight in the work-less, eat-more environment of Granny’s farm. I could barely get the girth around to the first hole. I guess we will have to schedule some more exercise for him. Jordyn focused on her riding and Kendyll focused on her walking! The weather is turning toward fall and temperatures were just in the upper 80’s last night as we got out to the arena. Kendyll walking sturdily now, thinks it is just a giant playpen for her amusement. Ally stands by horrified as the little one puts sand, dirt, rocks and other disgusting things in her mouth. Ally and Lauren pretty much grew up at the ballpark, at least there are not cigarette butts to find in my arena. Ally was not really consoled over that observation as Kendyll put Kona’s sand covered tennis ball in her mouth. I had set up poles for Jordyn and Snow to practice going over and turning around. Jordyn was handling Snow better and he had not gotten away with any of his usual pony exploits. However, this could be the harsher bit (a Kimberwick) Lauren installed on his bridle as much as increased riding brilliance from Jordyn, hard to tell, but it was going better. About 30 minutes into the ride, Jordyn asked me if I would come hold onto to Snowney’s bridle so she could trot. I was quite surprised although just matter-of-factly said okay and walked up to take hold of his reins. I asked her not to say anything to her mom or Lauren until we got going. And with no preamble, off we went. Granny jogging along as Snow started to trot. She asked excitedly, “Can I tell my mom?”. And she did, with both Ally and Lauren riveted between being excited to see Jordyn finally trotting and wanting to laugh at me as I jogged my way through the deep sand trying to keep pace with the white pony. “You are even posting!” Aunt Lauren exclaimed as we continued around the arena. And she was. The little girl who had been thrown so hard into ground from the back of a horse just a short time ago was confidently posting down the diagonal line. Granny was still holding on, but just barely. Jordyn was steering, posting and controlling her pony. Personally, I feel it was important to let Jordyn decide when she was ready to try again to trot (and then to do everything in my power to make it a safe, positive experience). I hope she can get down to spend the night and just get out in the arena to “play” on Snow. That is how confidence is gained. 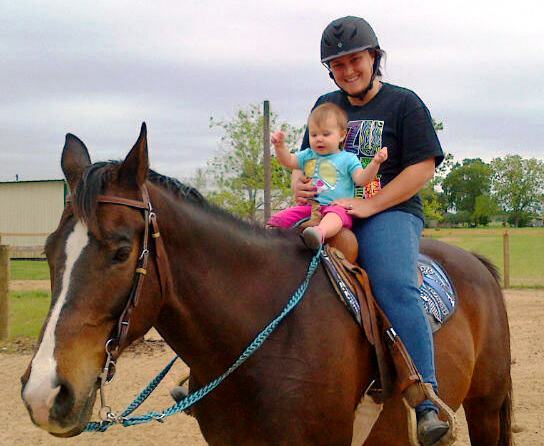 Kendyll wanted her time on the horse’s as well and next time I will be sure to bring the helmet out for her. Baby Kendyll riding with aunt Lauren. I am proud of Jordyn! I have a framed quote from John Wayne (if you don’t know who that is ask a parent). It says: Courage is being scared to death but saddling up and riding any way. Thank you for riding along and keep us in your prayers. It seems like there has been a lot going on these last few days-actually, just usual farm stuff, I have not left town in four days which maybe a record of sorts for me. I have enjoyed having this quiet week to rest, piddle around the place and get some chores done. 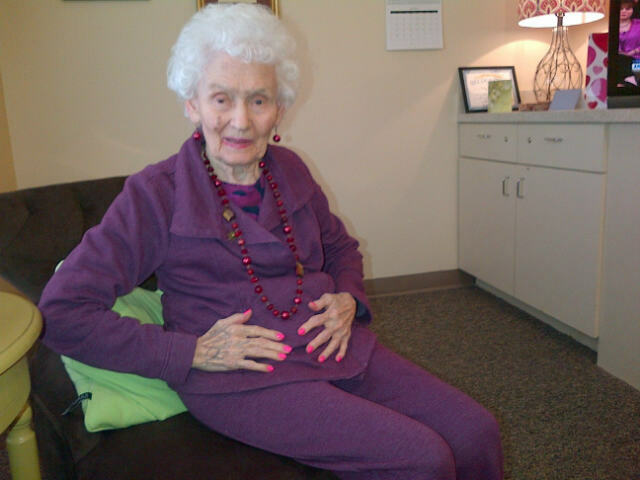 I have been to my mom’s assisted living place every day. Maybe it is just seeing her daily again after missing days right after surgery, but she seems brighter and happier to me. I had hired a sitter to come between 4-6 pm each day to get her to dinner and back. Each day when I get there she has on jewelry and today even had earrings on. She is very proud of her manicure we got the other day. Showing off her pink nails. 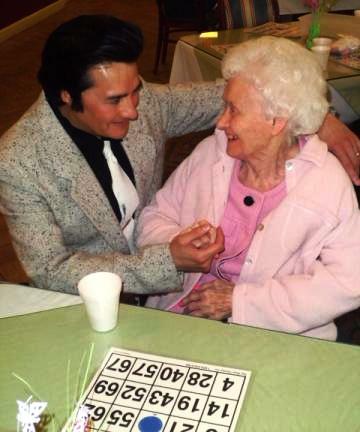 Yesterday, she left me behind again as the home was having an Elvis impersonator in the dining room. She practically dragged me down the hall. She hugged me goodbye and was groovin’ to the music as I left. He really was pretty good. 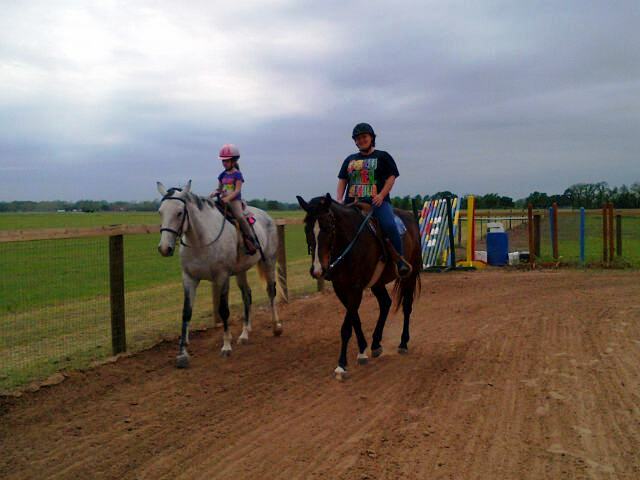 Ally, Jordyn and Kendyll came down tonight for their weekly horse back lesson. 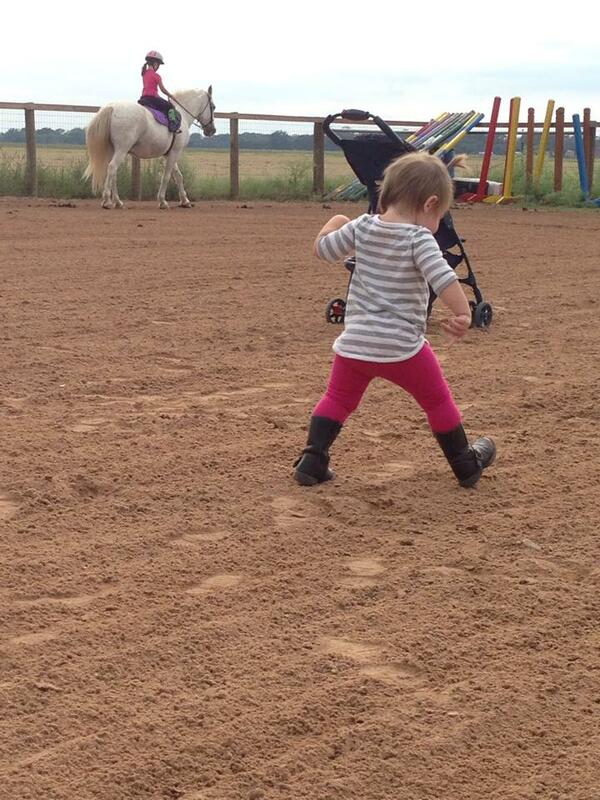 Jordyn is still reluctant to trot but is getting much better with the turning, stopping and riding on her own. I love seeing Ally ride. She was always a beautiful rider and it is good to see Mickey getting a work-out. Feather, especially being only six, is a saint with Jordyn. My shoulder restricts my typing ability so I am just going to let the pictures tell the rest of the story tonight. 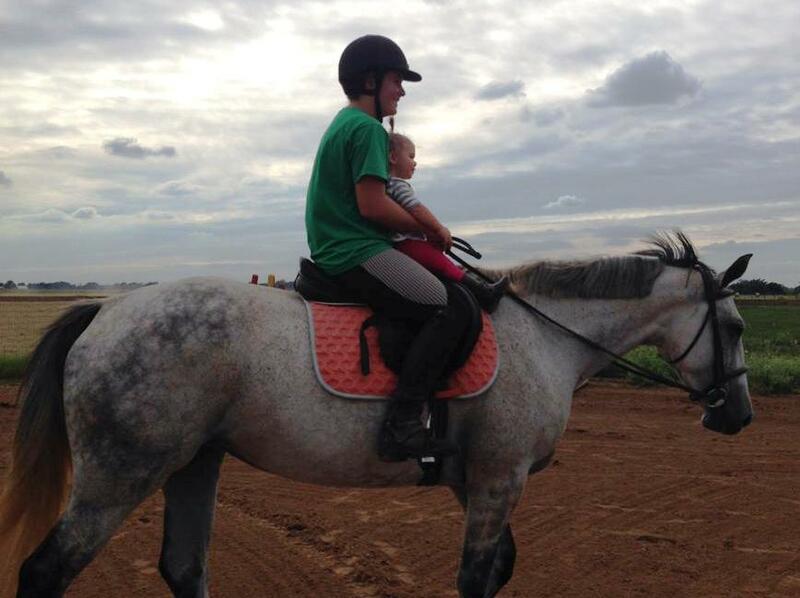 Lula steadfastly waiting with Kendyll as mom and sis ride. Kendyll FINALLY getting a turn! She says she was born to ride! 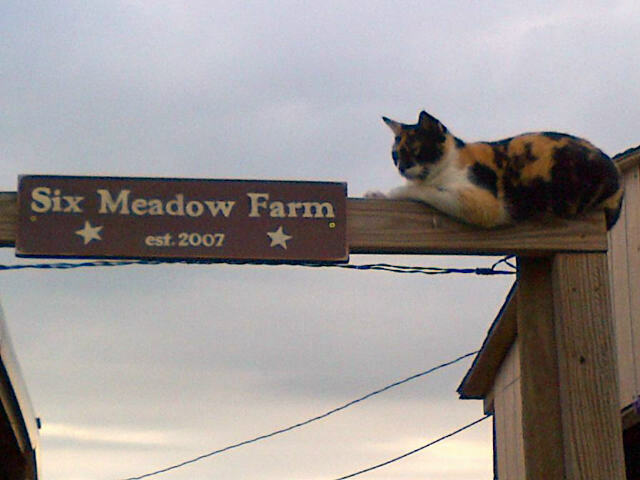 Thank you for riding along-it’s a very good night at Six Meadow Farm!